If you’re obsessed with the number of people that visit your site, you’re certainly not alone. I know it is a metric I pay attention to, because let’s face it — it feels pretty awesome when you see a sizeable increase in the number of people visiting your site. However, let’s not forget other metrics that are arguably just as (if not) more important. For instance, it doesn’t matter if you get 200,000 visitors per month if they all bounce off your site within seconds. I’d rather have 1,000 engaged visitors who stick around and convert. 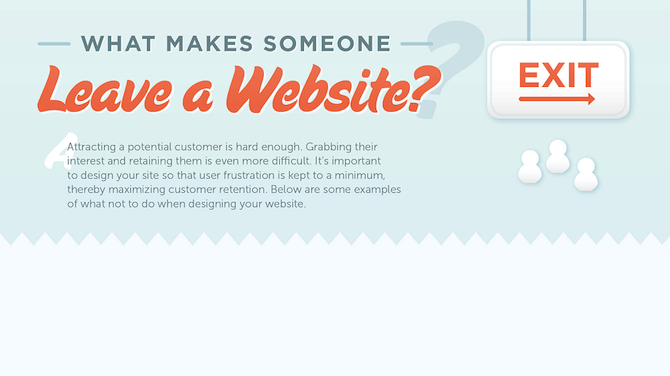 First of all, here’s a copy of that infographic, courtesy of KISSmetrics. To give you advanced warning, it’s a biggie! If people can’t easily navigate your site then they won’t stick around for long — they simply don’t have the patience (and rightly so). You may consider this to be an obvious statement but there are certainly some webmasters out there who haven’t got the message based upon my browsing experience. Good quality navigation comes down to one simple concept: give people what they expect. Or to put it another way, seek to emulate the typical form and placement of navigational elements on popular sites. If navigational elements are where people expect them to be, they’re going to have no issues at all. In terms of blog navigation this generally means a navigation bar at the top with further links in the sidebar. Make sure that your navigational elements are easy to spot and clearly identifiable. It could also be worth incorporating breadcrumbs navigation into your site — we published a tutorial on that topic recently. To put it simply, your content should be easy to read, interesting and engaging, and structured in an intuitive and engaging manner. When I say “easy to read” I’m talking about typography — an often undervalued element of design that can make all the difference to your site’s “stickiness.” I wrote a post on four steps to improving typography on your blog — check it out. The actual makeup of your content is of course of vital importance. It must be engaging and full of actionable and/or informative tidbits that is not readily available elsewhere. That sounds pretty tough — because it is — but it is possible. Just remember this — the quality and uniqueness of your content can have a bigger impact on the success of your site than anything else. Treat it with the appropriate level of respect. Finally, ensure that your content is structured in such a way that it is extremely easy to digest. We’ve already covered that with relation to typography but I’m also talking about your use of words (keep them short and simple), sentences (short and simple) and paragraphs (I’m sure you can guess this one). Include plenty of graphical elements such as images, graphs, tables, charts, lists, blockquotes and so on. Make reading your content an enjoyable experience not only for its informative and actionable nature but also the way in which it is presented. Think presentation: gourmet rather than fast food. If you make your site easy to navigate and your content easy and interesting to read, you’re probably about 70% of the way to getting things perfect. In my humble opinion, they are the two most important elements of increasing engagement on your site. But I’d love to know what your opinion is — after all, KISSmetrics included no less than eight different issues in their infographic. What do you consider vital to engagement and what are your proposed solutions? Let us know in the comments section! I am actually having doubts with the new design of my blog recently. It’s exactly about these things. Mainly about navigating and finding things easily. The thing is, I’ve redesigned it, and made it much simpler, no clutter at all, just content, and top navigation. The design is minimalistic also. I wonder whether it was a mistake to remove the sidebar, or a good thing. I didn’t quite have enough time to test it out and see the stats, but when I read your points now, it got me thinking about it again. One of my main pet peeves is a site where I can not find the contact info…I can’t tell you how many sites have lost my business because I couldn’t contact them and ask questions before the sale. If I can’t ask questions before the sale it’s a good bet I won’t be able to contact them for help after the sale. Absolutely! It’s a no brainer, and yet something many sites miss.